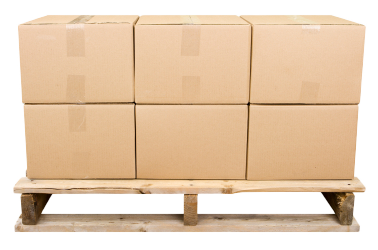 Everything you need to know about our shipping, all in one place. At Closets To Go every order is packaged with our customer's needs in mind. We take every step to make sure that your closet systems will be received in a timely manner and in good shape. Our shipping policies and details are below. If you don't see the information you're looking for, try our Frequently Asked Questions (FAQ) page. • Delivery will take 2-7 business days depending on your location. The trucking company will deliver to the bottom of your driveway unless you have paid for inside delivery to your garage. • You will receive an email with your tracking number. • We will replace any damaged parts at no charge. • When an order is received, immediately open and inspect for damage. If damage has occured, please note in detail on the bill of lading and if possible, collect photo evidence. Then contact Closets To Go right away to report your damage. At Closets To Go every order is packaged with our customer’s needs in mind. We take every step to make sure that your closet systems will be received in a timely manner and in good shape. Our care and attention to detail are represented in every closet organizer we create, so that the finished product is both easy to install and attractive in your home. At Closets To Go every order is packaged with our customer’s needs in mind. We take every step to make sure that your system(s) will be received in a timely manner and in good shape. 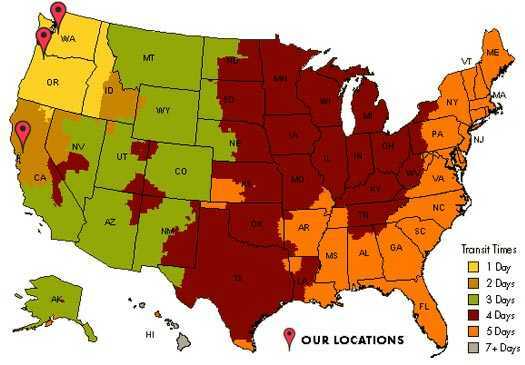 The map above shows the general transit times for your order to reach you from our Portland, Oregon location.